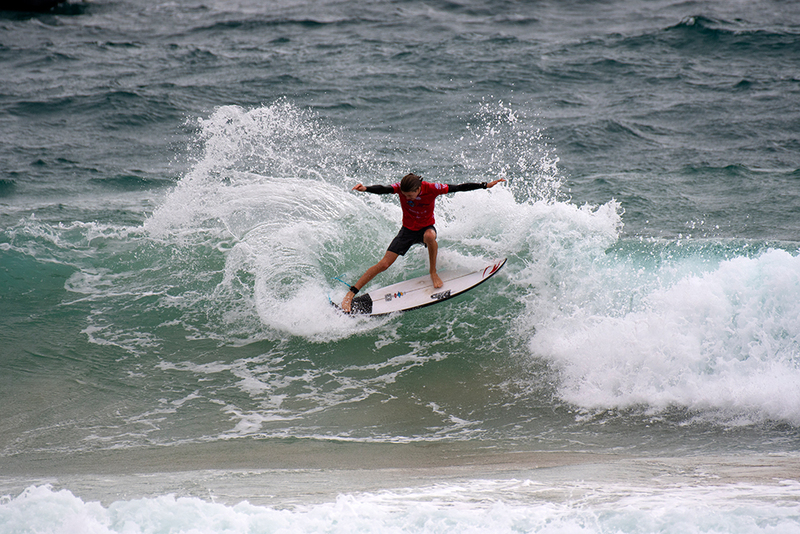 The 2019 Key Sun Zinke Sydney Pro Junior kicked off the first of nine days of the Vissla Sydney Surf Pro with some of the world’s most promising junior surfers tearing apart the junky two-foot surf. Local Manly surfer George Pittar (Manly, NSW) showed his knowledge of the shifting beachbreak conditions, picking the eyes out of the best waves of the heat and as a result, was rewarded with a solid 15.65 two-wave heat total. Pittar was greeted by much local fanfare on the shoreline from his local North Steyne Boardriders Club following the heat. Currently sitting in second position on the Australia/ Oceania Junior Tour rankings, Xavier Huxtable (Jan Juc, Vic) made sure he solidified his spot at the top end of the ratings, taking a massive round one victory. The Victorian natural-footer executed a handful of stylish and polished forehand wraps to notch up a 15.05 two-wave heat total and take a convincing win. Coming off an applauded performance at the nudie Australian Boardriders Battle National Final, Alister Reginato (Sunshine Coast, Qld) continued to show the level of talent as he emerged in his opening exchange at Manly. Reginato found a handful of diamonds in the rough over the course of the exchange to post an excellent 8.25 wave score for a variety of critical backside snaps and cement his spot into the second round. Holly Williams (Sunshine Coast, Qld) synced her powerful backhand repertoire with the mushy righthanders on offer, finding a handful of decent pockets. Williams knocked out a chain of impressive snaps to post a respectable 7.25 wave score and take the win ahead of an also impressive Carly Shanahan (Wooli, NSW). Having claimed the last two Pro Junior events in Australia, Molly Picklum (Shelly Beach, NSW) made it clear she was keen to bag herself a hat-trick, putting on a consistent performance in her opening heat. Picklum remained busy in the heat, catching a total of eight waves over the course of the heat and finished with a 12.85 two-wave total. The 2019 Key Sun Zinke Sydney Pro Junior will serve as the opener to the 2019 Vissla Sydney Surf Pro.